Deerstalker hat, 100% wool, brown check pattern hat, two brims, Italian finest quality handmade hat with English original fabric. Handmade in Italy by Verbano for Roberto Manzoni Ravenna. 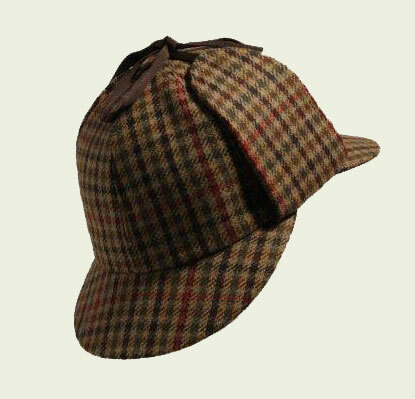 Sherlock Holmes wore a deerstalker similar-in-design hat, described by British author Sir Arthur Conan Doyle in the The Adventure Of Silver Blaze as "ear-flapped travelling cap". The deerstalker's main feature is a pair of fore and aft brims and two flexible side flaps. Originally it was a hat owrn in rural areas, often for hunting. Because of the association with Sherllock Holmes, it is now a stereotypical hat for detective.